I noticed that Aldi had started selling some lovely venison meatballs a while ago and for only 40kal a meatball, I knew I had to give them a go! 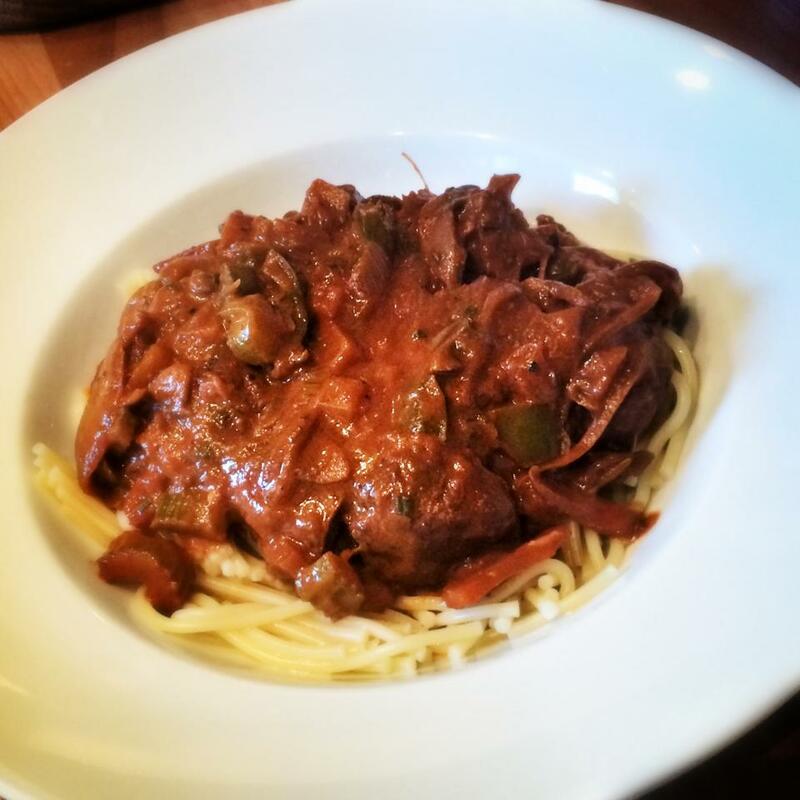 The venison is a lovely different flavour, and the ragu sauce, which usually would take hours to simmer and reduce, is both quick, easy and packed with veg! I added a little cream (1 tbsp) but this is optional, I find it takes a little of the tang of the tomatoes away, but it’s lovely without it too. It’s a great way to use up lots of veg and get a nice portion of sauce for not many points at all! Take a large frying pan, spray with low cal cooking spray and fry your meatballs for 10-12 minutes until nicely browned on the outside. Take off the heat and pop to one side. Meanwhile, in a large sauce pan, spray with low cal cooking spray and fry the onions for 3-4 minutes until they start to soften. Add a splash of water if needed to stop everything sticking to the bottom of the pan. Add the carrots and celery and cook for another few minutes and then add the peppers and mushrooms. Cook for another two minutes and then add the tomato puree. Give this a good stir and then cook for around 5 minutes until the tomato puree has nicely cooked and soaked into all of the vegetables. Next add the red wine and leave to simmer for a minute or two. Then add the stock along with the oregano, rosemary, cinnamon, nutmeg and bay leaf. Give a good stir, add the sugar and season well with salt and pepper. Pop the meatballs back into the sauce and then leave the whole thing to simmer on medium for around half an hour. The ragu sauce should start to reduce nicely. If you find your sauce is still to watery after 25 minutes, turn up the heat a little and this will help the reduction process along. After your sauce has been cooking for around 15 minute, pop your pasta on to boil. This way it should be cooked by the time your sauce is ready. Once everything is cooked, add the cream to the meatball sauce, stir and season again (if you need your sauce a little looser, add a splash of pasta water and stir in). Remove the bay leaf. Add a good grating of fresh parmesan (optional and no more than ½ tbsp) stir and voila! Pop your pasta into bowls and serve the venison meatballs, three per person. Top with the sauce and finish with a fine grating of parmesan!